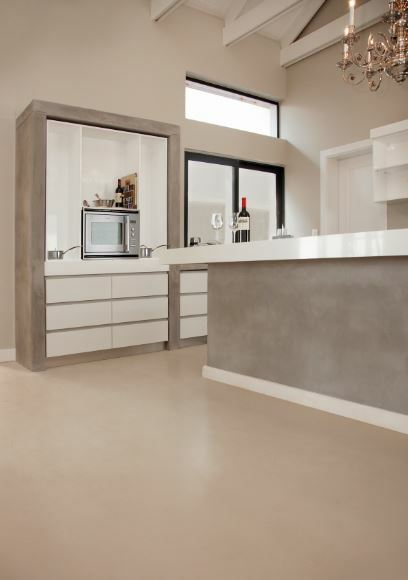 Concrete and concrete-look seamless flooring remains a popular aesthetic for both commercial and domestic spaces. This is largely due to the rising popularity of the minimalist, industrial look that interior designers the world over continue to explore. Seamless floors not only match this aesthetic perfectly, they are also hard-wearing, smooth and high-strength, making them a low maintenance solution. TAL SuperFlow, a cementitious self-levelling decorative screed provides a smooth floor surface with a homogenous finish. This screed product is a rapid-setting overlayment that can be installed on a new floor or over an existing substrate in both residential and light commercial interior applications. To get the look and benefits of a seamless floor in outdoor applications, TAL recommends DecoQuartz. This is a bespoke floor covering that has been created through a combination of coloured aggregates and covered by an epoxy resin. The long wearing product can be applied to steel and concrete and is suitable for schools, hospitals, canteens, break areas and food processing areas. TAL StoneFlow is recommended for applications that are exposed to heavy traffic and abrasion as well as commercial applications and is also suitable for use in direct sunlight. It includes a selection of aggregates, or small stones, which are then ground and polished to a smooth surface, producing a uniformly textured terrazzo effect. This floor is best installed in a new building rather than retrofitting an existing floor because the process of grinding and polishing can be quite dusty. Consideration of the service conditions is key when selecting the right floor covering for your project. Ensure success by specifying the performance required for the specific project, in addition to the correct application.